Ramón del Fierro Magsaysay was born in Iba, Zambales on August 31, 1907 to Exequiel Magsaysay y de los Santos (April 18, 1874 in San Marcelino, Zambales - January 24, 1968 in Manila), a blacksmith, and Perfecta del Fierro y Quimson (April 18, 1887 in Castillejos, Zambales - May 5, 1980 in Manila), a schoolteacher. He spent his elementary life somewhere in Castillejos and his high school life at Zambales Academy at San Narciso, Zambales. After high school, Magsaysay entered the University of the Philippines in 1927, where he enrolled in a pre-medical course. 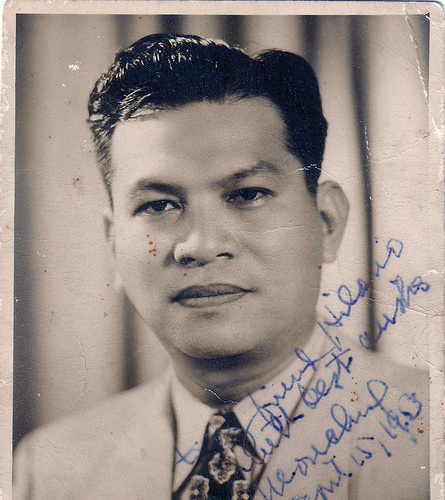 He worked as a chauffeur to support himself as he studied engineering; and later, he transferred to the Institute of Commerce at José Rizal College (1928–1932), where he received a baccalaureate in commerce. He then worked as an automobile mechanic in a bus company (Florida) and shop superintendent. He was married to Luz Magsaysay (née Banzon) in June 16, 1933 and they had three children: Teresita Banzon-Magsaysay (1934–1979), Milagros "Mila" Banzon-Magsaysay (b. 1936) and Ramon "Jun" Banzon-Magsaysay, Jr. (b. 1938). On 22 April 1946, Magsaysay, encouraged by his ex-guerrillas, was elected under the Liberal Party to the Philippine House of Representatives. In 1948, President Manuel Roxas chose Magsaysay to go to Washington as Chairman of the Committee on Guerrilla Affairs, to help to secure passage of the Rogers Veterans Bill, giving benefits to Philippine veterans. In the so-called "dirty election" of 1949, he was re-elected to a second term in the House of Representatives. During both terms he was Chairman of the House National Defense Committee. When news reached Magsaysay that his political ally Moises Padilla was being tortured by the forces of provincial governor Lacson, he rushed to Negros Occidental, but was too late. He was then informed that Padilla's body was swimming in blood, pierced by fourteen bullets, and was positioned on a police bench in the town plaza. Magsaysay himself carried Padilla's corpse with his bare hands and delivered it to the morgue, and the next day, news clips showed pictures of him doing so. Magsaysay even used this event during his presidential campaign in 1953. The trial against Lacson started in January 1952; Magsaysay and his men presented enough evidence to convict Lacson and his 26 men for murder. In August 1954, Judge Eduardo Enriquez ruled the men were guilty and Lacson, his 22 men and three other mayors of Negros Occidental municipalities were condemned to the electric chair. Presidential election of 1953 - This was the first time that an elected Philippine president did not come from the Senate. Magsaysay started the practice in the Philippines of "campaign jingles" during elections, for one of his inclinations and hobbies was dancing. In the Election of 1953, Magsaysay was decisively elected president over the incumbent Elpidio Quirino. He was sworn into office wearing the Barong Tagalog, a first by a Philippine president. He was then called "Mambo Magsaysay". As president, he was a close friend and supporter of the United States and a vocal spokesman against communism during the Cold War. He led the foundation of the Southeast Asia Treaty Organization also known as the Manila Pact of 1954, that aimed to defeat communist-Marxist movements in South East Asia, South Asia and the Southwestern Pacific. During his term, he made Malacañang literally a "house of the people", opening its gates to the public. One example of his integrity followed a demonstration flight aboard a new plane belonging to the Philippine Air Force (PAF): President Magsaysay asked what the operating costs per hour were for that type of aircraft, then wrote a personal check to the PAF, covering the cost of his flight. He brought back the people's trust in the military and in the government. His administration was considered one of the cleanest and most corruption-free; his presidency was cited as the Philippines' Golden Years. Trade and industry flourished, the Philippine military was at its prime, and the Filipino people were given international recognition in sports, culture and foreign affairs. The Philippines ranked second in Asia's clean and well-governed countries. Magsaysay's term, which was to end on 30 December 1957, was cut short by a plane crash. On 16 March 1957, Magsaysay left Manila for Cebu City where he spoke at three educational institutions. That same night, at about 1 am, he boarded the presidential plane "Mt. Pinatubo", a C-47, heading back to Manila. In the early morning hours of 17 March, the plane was reported missing. By late afternoon, newspapers had reported the airplane had crashed on Mt. Manunggal in Cebu, and that 36 of the 56 aboard were killed (the actual number on board was 25, including Magsaysay). Only newspaperman Néstor Mata survived. Vice-President Carlos García, who was on an official visit to Australia at the time, assumed the presidency to serve out the last eight months of Magsaysay's term. An estimated 2 million people attended Magsaysay's burial on 31 March 1957. He was posthumously referred to by people as the "Idol of the Masses".